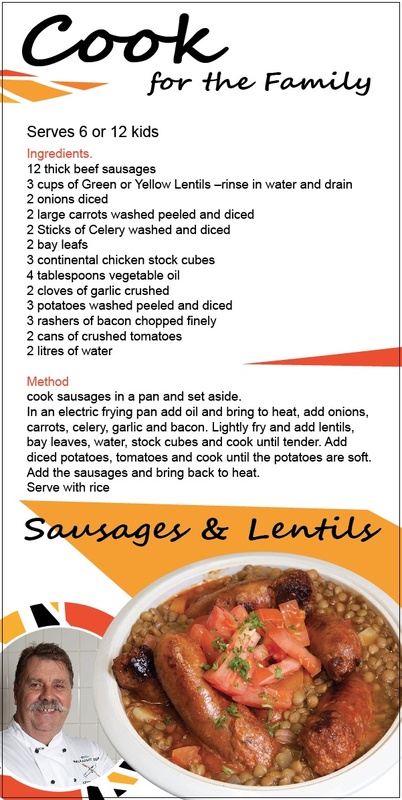 One the Money Business Cookery Recipe Cards, Sausages and Lentils. With nutrition, simplicity and affordability its cornerstones, a set of recipe cards is about to revolutionise the way Indigenous communities go about meal time. Just launched at the Bathurst Island community of Nguiu, the Money Business Cookery Recipe Cards promote healthy living, nutritional awareness, and social and community wellbeing. Headed by celebrated Charles Darwin University cooking identity Steve “The Walkabout Chef” Sunk, the program has produced 10 simple coated recipe cards complete with colour photos, easy-to-follow instructions, and alternative ingredients. Mr Sunk said the concept originated through the Back to Basics program in cookery held in remote communities throughout the Territory and Western Australia over the past 15 years. “While teaching cookery at these communities, I found the need to simplify cookery production as there is limited equipment available,” he said. Recipes prepared at the program launch included wallaby tail stew, curried chicken, sweet and sour fish and chilli concarne (kangaroo mince). Mr Sunk said the cards would be distributed by the Outback Stores in all Territory communities with the view to expand to the Kimberley area in the future. All recipes have extensive nutritional benefits, are low in salt and fats, use large components of vegetables, and use ingredients available in store and by hunting and gathering. Most importantly, these will be easy to make with minimal equipment and can be produced for less than $12 to feed a family of four to six people. Mr Sunk acknowledged the efforts of fellow CDU Cookery lecturer Rachelle Richardson, Tiwi Islands Training and Employment Board CEO Norm Buchan, and the sponsorship of Nestle, Arafura Catering Equipment and Outback Stores for being instrumental in the program’s success.